Thank You Anna and Lew! KitchenAble > Announcements > Upcoming Classes > Announcements > Thank You Anna and Lew! If you caught the Real Estate Weekend Showcase last week you know that Jessica joined Anna Johnson and Lew Wilson on Saturday, July 12 for their show. You can watch the episode here. 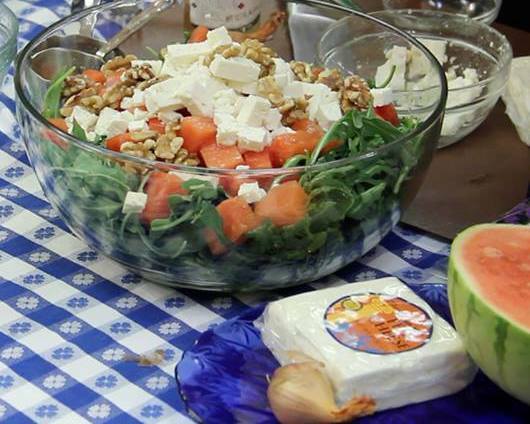 The delicious watermelon salad is very simple to make- the perfect recipe for any summer picnic or barbeque. Separate the shallots in to rings and place in vinegar, whisk in oil, salt and pepper. Gently stir in the cubed watermelon. Place arugula on a platter and top with the melon and dressing. Garnish with toasted walnuts and feta if desired.